A young woman struggles with her unconventional mom, her best friend's cold shoulder, and a fierce crush in this novel for teens set in Newfoundland. At the onset of her grade 10 year, Flannery is delighted to be paired for a project in her entrepreneurship class with Tyrone, her goofy pal from childhood reinvented as a teen as a motorcycle-driving graffiti artist who turns the heads of girls everywhere, including orange-haired, pale, freckled Flannery's. Readers will feel her swooning in their knees from the evocative descriptions of Tyrone's sooty black lashes, big brown eyes, and curly black hair. This at first seems to set the stage for a simple romance, and the frenetic prose, overflowing with playful wordsmithing and exaggeration, sets a similar light tone. 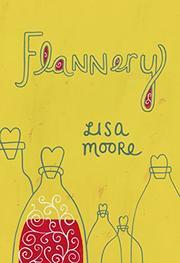 However, Flannery's close yet emotionally fraught relationship with her free-spirit mother packs a serious punch, and her shame and frustration at her family's poverty—her mother raises her and her younger brother with the help of public assistance—are stingingly real. Adding to this is Flannery's anguishing betrayal by her best friend, who completely loses herself in her first boyfriend. If readers stumble a bit as they acclimate to the gradual shift to drama, they will root for Flannery's honest kindness throughout.